Several major internal political events hinged on the participation (or lack of participation) of the Navy. 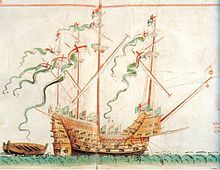 First, at the end of the years of the Protectorate, the English Royal Navy brought Charles II back from his exile in Holland in May 1660, aboard the hastily renamed HMS Royal Charles (1655). 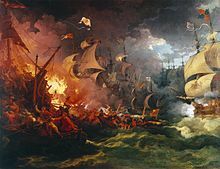 Again in 1688, the monarchy changed leadership as Roman Catholic James II fled the country; the English fleet made no effort oppose the landing of the Protestant William of Orange. ^ Rodger, N.A.M. (2004). The Command of the Ocean. London: Penguin Books. p. 31. ISBN 978-0-14-102690-9.